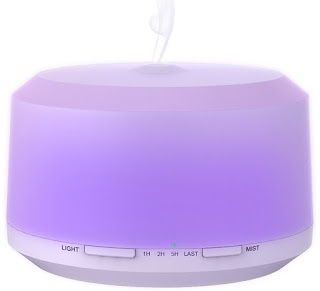 Check out this Essential Oil Diffuser with LED Lamp ONLY $12.03 (Retail $89.99). 🌹 450ML Water Tank: With a large size,The Aromatherapy Essential Oil Diffuser can holds 450 mL (15.4-ounces) water, No need to refill frequently. 🌹4 Timer and 8 LED Light Changing Settings:The Aromatherapy Essential Oil Diffuser has misting and light features as well as a timer, it can be set for 1-, 2, or 5-hours to run on intermittent mode or continually on up to 10 hours and will automatically shut down once she drifts off. 🌹 5-in-1 Unit:Not only economical and beautiful, but this aromatherapy air diffuser is practical.It can be used as a small humidifier,a nightlight .It also can emits negative ions and purifies the air up to 300sq. 🌹Noiseless and helpful:The Aromatherapy Essential Oil Diffuser is BPA FREE and whisper quiet. You can put it in everywhere you want. Such as office, baby nursery, yoga studio etc.It will help you eliminate odors,improve dry flaky skin, lubricate sinuses, and dry coughs. 🌹Great Valentine Gift: Gift-wrapping is available for your loved ones and friends. You will receive the User's Manual, water measuring cup, A/C adapter. 100% new with 30 days money-back guarantee and 90-day warranty. Your satisfaction is guaranteed.